"The Town of Wakefield is fortunate to have two fire stations to service the needs of the community, one in close proximity to Wakefield Square, the other in the Greenwood section of town. The central station was located near the Wakefield Common on Church Street until the official opening of a new station in 1891 at the corner of Crescent and Mechanic Streets. T he station house was formerly the Academy Hill Center School (circa 1853) which was moved from its location a few hundred yards away on the current site of the Lincoln School House. Bricks from the Church Street station were used for the foundation and the total cost of renovating and moving the former school building was $6000. The station house was in operation until the Hathaway Fire of October 23, 1899. A new station was built shortly thereafter in 1900 by Roger Howard of Wakefield at a cost of $14,554. The station was officially opened on December 22, 1900. As the town grew, so did the Fire Department. In 1902 the original Greenwood Fire Station was built, recycled from the former Greenwood School. The original structure was built in 1847 and was located on the East side of Main Street, just south of Meriam Street. The building was later moved to Oak Street in 1858 at a cost of $450. 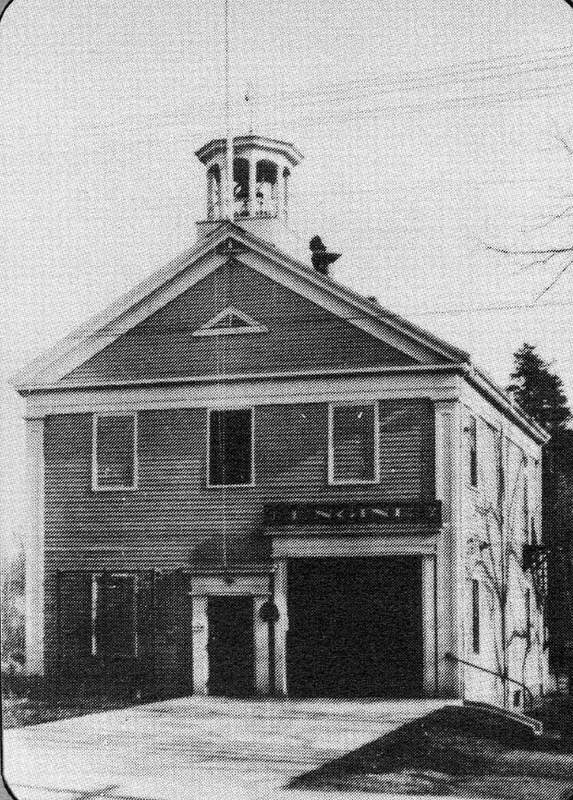 The schoolhouse was converted in 1902 to Greenwood Engine 2 Station and remained in operation until it was torn down in 1962. The existing Greenwood Fire Station was opened on Monday, May 6, 1962 and also housed the Greenwood Branch of the Lucius Beebe Memorial Library." -- Text from calendar. ;Captions: 1. The Greenwood Station today. -- 2. The Central Fire Station today. The addition on the right was built in 1975. -- 3. 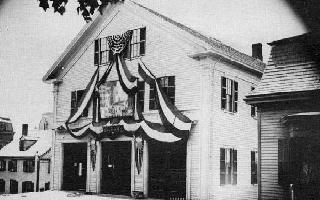 The Central Fire Station in 1894 during the 250th anniversary celebration of the town. At the time, the station housed the Silsby Steamer 'Lucius Beebe No. 1', supply and hose wagons for the steamer and Abbott Downing Ladder Truck. -- 4. 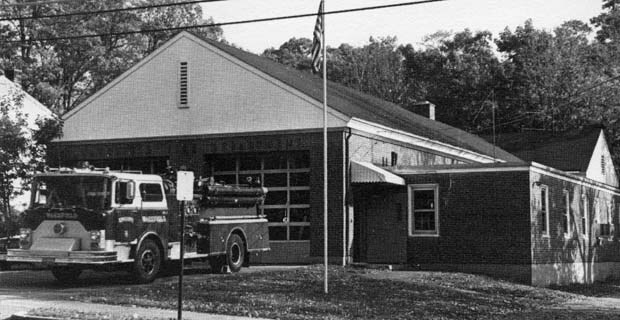 The Greenwood Fire Station in 1931 was the former Greenwood School. It was converted to the Greenwood Engine 2 Station in 1902 and was in operation until 1962. Photos courtesy of the Wakefield Fire Department and Murray Young. 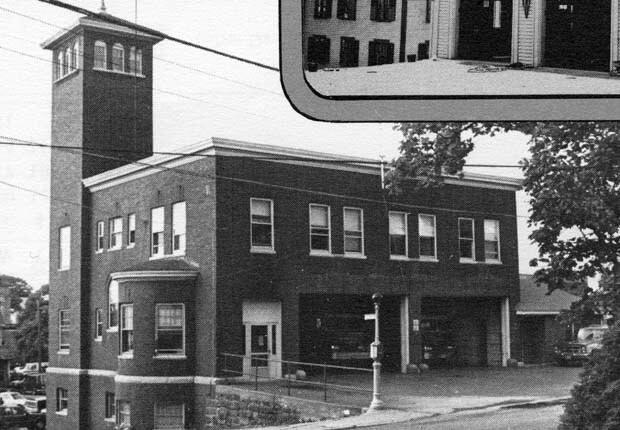 “Wakefield fire stations,” NOBLE Digital Heritage, accessed April 20, 2019, https://digitalheritage.noblenet.org/noble/items/show/7127.